Launched in 2001, SharePoint is an online collaborative platform which offers integration with Microsoft Office. While sold as a storage and document management system, SharePoint is can be easily configured and customised to meet the needs and requirements of a wide range of organisations. Collaboration: It is a comprehensive platform for teams to be able to work together. That is, in SharePoint, it is possible for multiple people in a team, who may be a part of a team site, to work together on one document, list, etc. It is intended for intensive collaborative work. Interoperability: It enables computer software to exchange data or information. Since this is a cloud-based platform, all web-integrated information can be shared and used across different computer systems. Platform: The developer tools and cloud integration provide the platform for collaboration and interoperability. Learn how to use SharePoint, from beginner basics to advanced techniques. Enroll for Free SharePoint TrainingDemo! Sharepoint has a twin benefit of being available as an on-premise version as well as an online, cloud integrated version. 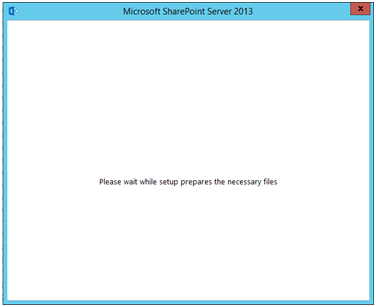 The on-premise version has two types; SharePoint Foundation and SharePoint Server. 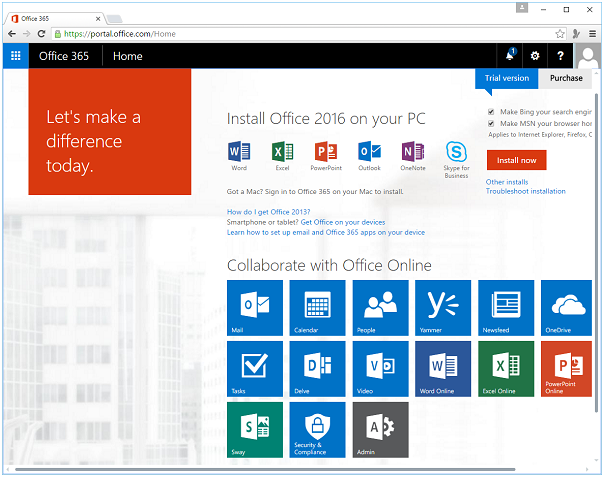 Office 365 is the cloud-integrated, fully online version of SharePoint. Customizing and expanding SharePoint Foundation enables web collaboration. It consists of the foundational features of SharePoint and is a user-friendly platform for collaboration. This is essentially an upgrade from the SharePoint Foundation platform. It provides some advanced features apart from the core features available on the Foundation version. The advanced features of the SharePoint Server are as follows. Advanced search: It allows users to create customized search pages with customised results. Web content management: With SharePoint Server, you can create and publish content on the internet. Enterprise services: Allows you to make solutions with tools available among Office products. Business connectivity services: Users can access external data sources and publish business data using web parts, user profiles, or lists. This is essentially the online version of SharePoint. It provides licenses based on number of users, nature of content, etcetera. Allows app development without having to pay on-premise costs. SharePoint makes it possible for multiple people to work within a team. You can work on a single document at the same time from different locations. Being a cloud-based facility, all web integrated information can be shared and accessed across different computer systems. One does not have to bother about investing memory space in order to be able to access or edit any documents. All the taska can take place online on the same platform. Here is an easy guide to exploring all the facets of SharePoint describing how it can be used in different contexts. The first thing to think about is what version of the software you will be using. There are different versions available and you need to choose the one that suits your requirements. There is an on-premise version as well as on online, or cloud integrated version. Now, you need to consider the network availability for a strong internet connection before opting for any of the two. Both versions have their own benefits. The online version can make things a lot easier for use provided that internet is not a problem. There can be an immediate update of all progress within the group. However, if this is not needed for your project or business, and internet availability happens to be a problem, then one might want to consider the offline features. One needs to navigate the team site. For this, start with launching, open your preferred choice of a browser, and then type the address of your team site in the browser. The top link bar can be used for navigating. The title name will show which tea site you are on currently. You can navigate between the parent site and a created child site by using Quick Launch. This is the section where you can use any documents from the quick launch menu. The idea is to be able to swiftly move from one zone to another within the site. The home page can be accessed as well along with the setting for your user profile. These features are usually related with the initial setting up of the team and its requirements. Once this is sorted out, one can focus on the more specific features and functions. Sites: This is where you can collaborate on and create, store and retrieve data. Content management, tagging searching, documentation and information all take place here. Content: You can find, explore and manage content here. Web, pages, apps, workflow or content types help with this. Search: This allows you to search for content within SharePoint. Insights: This represents business intelligence features such as key performance indicators. Communities: This is the social feature that facilitates communication. Composites: This represents the capability to integrate external services, for example, by business connectivity services. 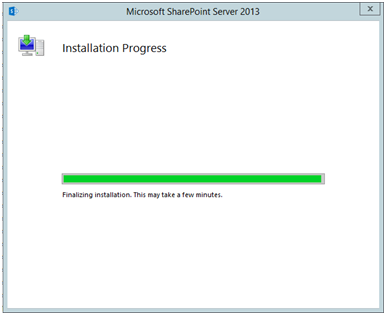 One can follow the stepwise guide to installing SharePoint. Wait till necessary files are prepared. The installation process will begin here. After this, the ‘Run Configuration Wizard’ will complete the installation. 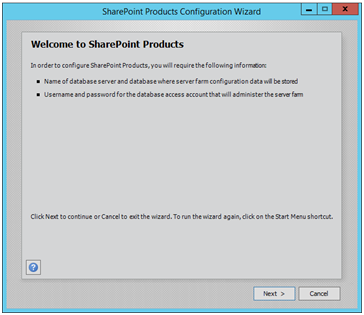 You can select the ‘Run the SharePoint Products Configuration Wizard now’ Check Box. 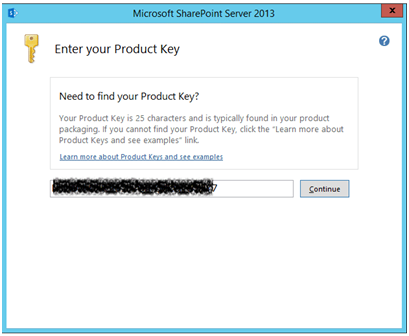 If you want to continue with configuration of SharePoint products, click on ‘Close’. 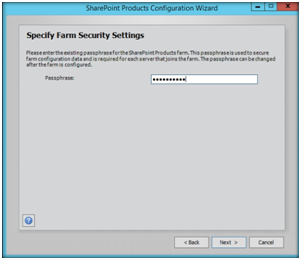 On the ‘Specify Farm Security Settings’ window, you need to put in the password to secure the configuration data. 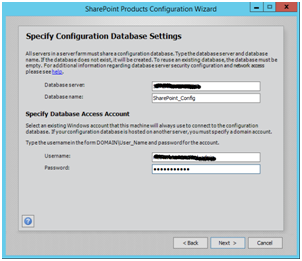 On the Services window, you can configure new ‘Service Accounts’ to use SharePoint. Site collection: Site collection is a foundational feature of SharePoint. Without a site collection, you cannot start developing SharePoint. It is the root site which consists of subsites. It allows you to perform functions within a given parameter without affecting other users. When it is complete, the ‘successful’ message will pop up. After waiting for a while, your first site should be created. This is how you can create your site and then quickly get started with your projects and management. The process of sharing and file manipulation can now begin! .NET Framework client object model, Silverlight client object model, REST/OData endpoints A web application using ASP.NET can be made to perform Create, Read, Update, and Delete operations on data in SharePoint or external data which has manifested in SharePoint due to Business Connectivity Service content type. Across a firewall it doesn’t have to be called SharePoint. 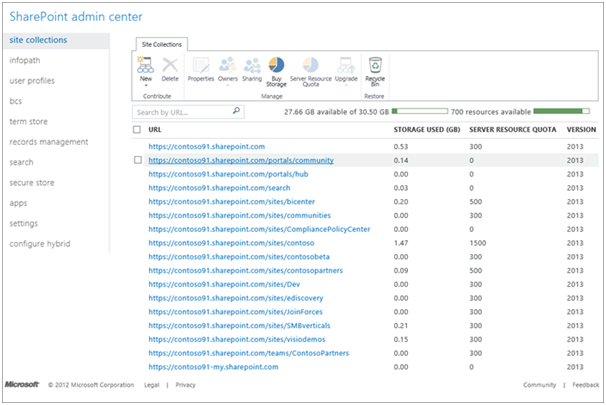 REST/OData endpoints A web application using LAMP can be made to perform Create, Read, Update, and Delete operations on data in SharePoint or external data which has manifested in SharePoint due to Business Connectivity Service content type. It can also be used to build an iOS or Android app that performs Create, Read, Update, and Delete operations in SharePoint. Mobile client object model Build a windows phone app that performs Create, Read, Update, and Delete operations in SharePoint. Mobile client object model and the server object model A windows phone app can be built to use Microsoft push notifications to notify the mobile device about events in SharePoint. .NET Framework client object model A .NET Framework model can be built to perform Create, Read, Update, and Delete operations on data in SharePoint. Silverlight client object model A Silverlight framework model can be built to perform Create, Read, Update, and Delete operations on data in SharePoint. Server object model Can be used to create a custom Windows PowerShell command, timer job, an extension of Central Administration, consistent branding across an entire SharePoint farm and a custom Web Part, application page, or ASP.NET user control. ASP.NET: ASP.NET is a server sided open source web application which is used to develop dynamic web pages. It can be integrated with SharePoint which can build in collaboration with ASP.NET. Many features of ASP.NET can be used in addition here. REST/OData: REST can be used to interact with the SharePoint sites from a remote location. There is a facilitation of direct access of SharePoint objects with the use of any technology which is compatible with any technology which supports REST functionalities. .NET Framework: .NET is a framework which is used in the application development for windows. It facilitates a controlled form of an environment under which the development and installation of applications can take place. This can be used in integration with SharePoint as the features for web page creation and management can be easily accessed. 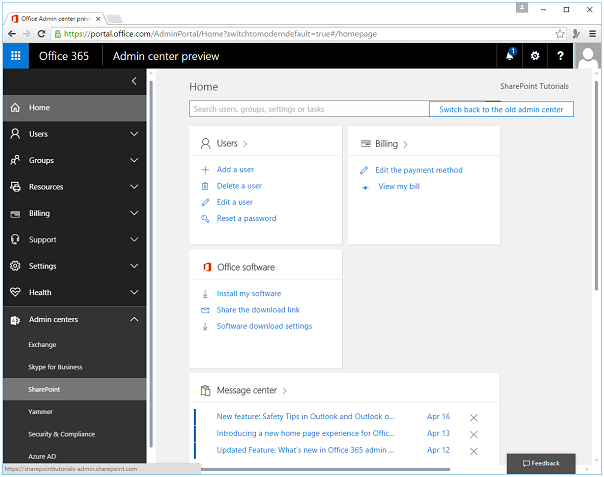 Windows Phone: Team sites can be viewed in sharepoint online if a windows phone is being used which includes sharepoint in Office 365 subscription. Silverlight: Silverlight is present in the 2010 version of SharePoint where referencing can be done by the document library URL. Thus, applications can be easily accessed and added to the content pages. Windows PowerShell: Windows PowerShell is command line shell which is task based. By using PowerShell cmdlets, SharePoint server and SharePoint online can be managed. You can make new web apps or site collections. 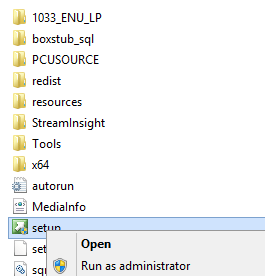 Word, Excel, Business Connectivity Services and other services that are installed on your SharePoint can be managed under this tab. Properties of the content database can also be altered under this tab. The tool kit for creating and managing reports, running diagnostics, and viewing the reports of server-side activities. Configuring and managing service accounts. Managing password change settings and policies. Specifications of authentication and trusted identity providers. General application settings: General options for SharePoint site collections can be configured and users can be mailed under this tab. Various deployment and approval options can also be granted under this tab. This is the equivalent of general settings for SharePoint. Backup and restore: Regular back ups can be scheduled or ad-hoc backups can be done under this tab. 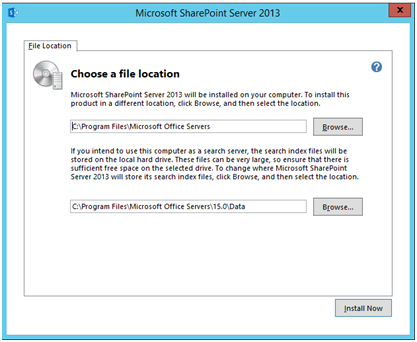 You can restore your previous SharePoint version from here. 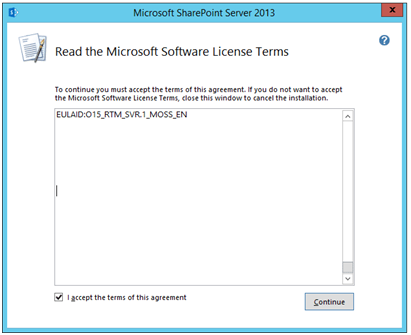 Upgrade and migration: In order to upgrade your SharePoint, you will need licensing and the facility to do so. This is done under this tab. Server patches can be installed, and you can check on updating and installation processes here. 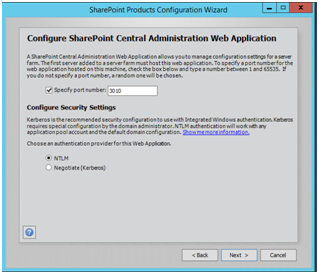 Configuration wizard: You would have noticed this when you first installed SharePoint. However, you can run it again after some installation. Apps: From here, you can manage the various aspects of the apps that are installed on your SharePoint. Click on ‘list’ to access all related ribbon items. Data: All the organized information in SharePoint collections may be referred to as data. Anything that is stored in the lists, libraries, etc., can be called data. Here, you can manage your data and maintain it in a way that can be efficient to enhance team productivity. Web part: A web part is a reusable part to display web pages in SharePoint. They help construct a web page. The construction of the web pages and their relevance with the projects can be managed here. Libraries: This is where team members can upload, create, update, and collaborate on various aspects. A library consists of several lists.This can be an interesting zone to be able to bring together all your creations collectively. Rest APIs: The Create, Read, Update, and Develop aspects can be performed on SharePoint with the help of Rest APIs. It shows all the functions and possibilities available to the clients. The Azure platform has several services. It can be used for application design, deployment, and management such as Data, Service, and the client layer of Integration, which uses the services within Microsoft Azure. These are some integral layers and application features that are necessary to understand the functioning of the Azure platform. This has default services such as creating a website, worker role classes, and using Hadoop to process Big Data requests. These services come with a baked-in functionality and a set of APIs within each application. Azure not only has services, but you can also develop cloud-based apps in it. For this, you need the latest visual studio and Microsoft Azure subscription. SharePoint apps are cloud-based. Till the 2010 version, Azure and SharePoint were two separate platforms but the 2013 version made them integrated. The model essentially relies on Azure features and SharePoint deployment. They natively support a set of Azure features such as Web Sites and SQL Database with development and deployment by SharePoint. They integrate with a wider range of web technologies and standards, Azure being one among them. Farm solutions: Farm solutions are hosted in the IIS worker process (W3WP.exe). They run the code that can impact the whole farm. When you use farm solutions, the system's IIS application pool recycles before SharePoint can retract or deploy the feature to release IIS worker process locked files. Nothing is recycled except the IIS application pool serving the site URL of the SharePoint project. Sandbox solutions: Sandboxed solutions are hosted in the SharePoint user code solution worker process (SPUCWorkerProcess.exe). It runs code that can only impact the solution’s site collection of the solution. 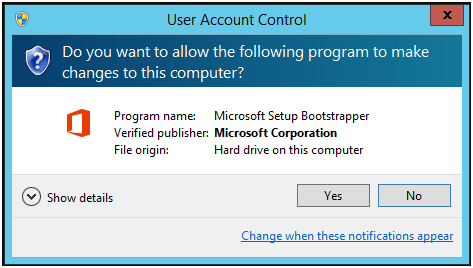 Both the IIS application pool and the IIS server should not restart since the boxed solutions do not run in the IIS worker process. Visual Studio attaches the debugger to the SPUCWorkerProcess process that is triggered and controlled automatically by the SPUserCodeV4 service in SharePoint. The SPUC Worker Process process need not be recycled to load the latest version of the solution. Deployment of sandbox solutions: After customizing the Features and package in Visual Studio, a .wsp file can be created to deploy to SharePoint servers. Only on the SharePoint server on the development computer, the Visual Studio can be used to debug and test the .wsp. These are some basic steps walking you through the use of SharePoint in order to extract maximum benefit and an optimum use. You can be actively involved in the SharePoint community for other specific discussions. There is a multitude of types of groups and businesses making an active use of the application. One can enhance their productivity and take sharing and collaboration to a notch up through SharePoint and its multifaceted features.